Having grown up in Kansas, I never knew that not only do babies love avocados, they are also very healthy and good for them. I love guacamole and make it often, although my version is sweeter than what you get at most restaurants. 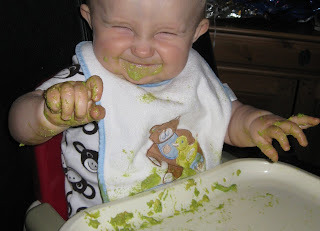 The other day I decided to make two kinds of guac, one for my husband and I and one for the baby. Since Jonas wants to try everything we have at the table, it was a great way for him to take part at dinner. You can see in the picture just how much fun he was having! 1. Mash avocado together with banana until nice and mushy. 2. Add finely chopped cilantro and lime juice. 1. Add all ingredients to a food processer or puree until smooth.